« It’s our 21st birthday! Organised in collaboration with the University of Edinburgh’s Staff Pride Network and Lighthouse Bookshop. Forty years ago, on November 27, 1978, Harvey Milk’s iconic journey was ended by an assassin’s bullet. The generation of out LGBTQ leaders he inspired went on to transform the world we live in. 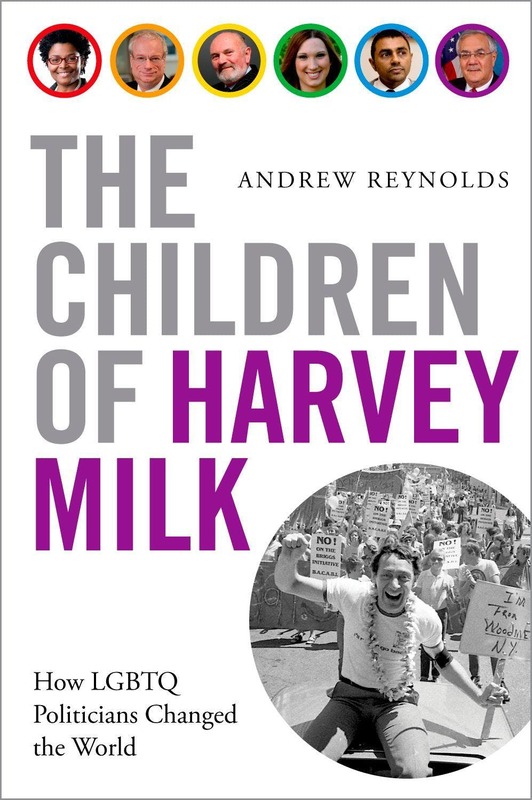 UNC-Chapel Hill Professor of Political Science, Andrew Reynolds, has documented this history in his new book The Children of Harvey Milk: How LGBTQ Politicians Changed the World. Please join us for a very special event to launch this inspiring book! Part political thriller, part meditation on social change, part love story, The Children of Harvey Milk tells the epic stories of courageous men and women around the world who came forward to make their voices heard during the struggle for equal rights. The book is based on deeply personal and revealing interviews with over ninety elected officials and high-profile candidates from across the globe—including the United Kingdom, United States, Africa, Asia, and the Caribbean. Publishing exactly 40 years after Harvey Milk’s assassination, it brings us up to date on global breakthroughs and reveals the extent to which individuals have served as the catalyst for change when it comes to LGBTQ rights. Louisa Wall MP (New Zealand) is known as the ‘mother of marriage equality’ in New Zealand, as the sponsor of their 2013 law. A Labour MP from Auckland she is Maori and a world cup winning sportswoman. Sunil Babu Pant (Nepal) was the first, out MP to be elected in Asia in 2008. He was instrumental in entrenching gay rights in the Constitution of Nepal and having a ‘third gender’ identity option recognized for Nepali passports and documents. Sarah McBride (USA) was the first trans woman to speak at a national party convention in America. She is the Press Officer for the Human Rights Campaign and one of the most visible and beloved trans politicians in America. Coos Huijsen (Netherlands) became the first out gay parliamentarian in history when he was elected to the Dutch parliament in 1976. Katie Hill (USA) is a Democrat poised to take the US House California 25th district from the Republicans in November 2018. She is an out bisexual woman. Lord Chris Smith (UK) is the Master of Pembroke College, Cambridge. He was the first British MP to come out, the first out gay cabinet minister and the first parliamentarian to acknowledge his HIV+ status. The Scottish playwright, Jo Clifford, will be chairing the event. Lighthouse Books will be selling the book on the night. Followed by book signing and drinks reception.